The industrial asset class is considered one of the four major pillars of commercial real estate, along with office, retail, and multifamily. According to Deloitte’s estimate, approximately 20% of the global commercial real estate is composed of industrial properties. 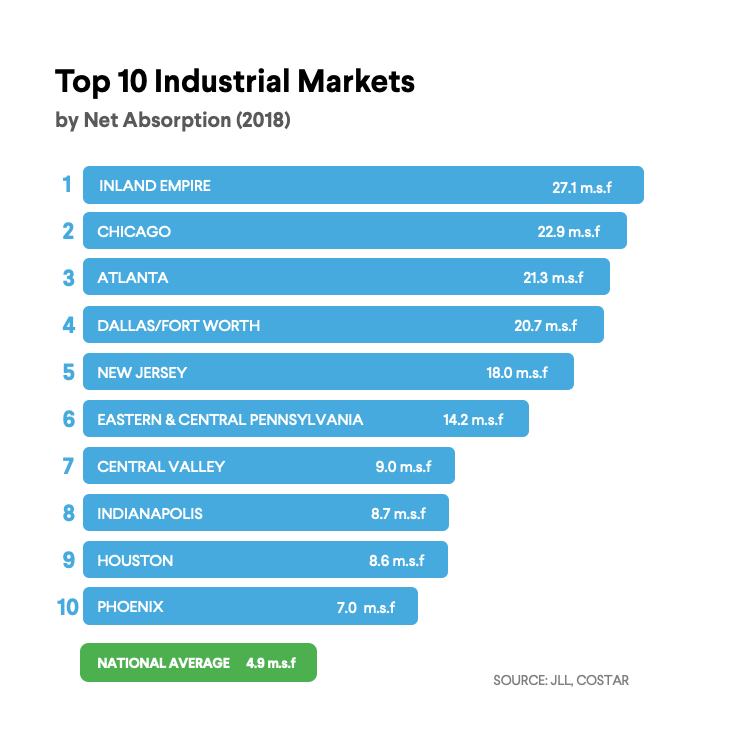 While industrial assets may not have the curb appeal of other property types, demand for industrial investments has surged over the past few years as the sector transforms to accommodate high-growth industries. The proliferation of e-commerce, internet technology companies, and manufacturing is demanding new industrial spaces to accommodate their growing presence. In this article, we will dive into the fundamentals of industrial assets and highlight the specific demand drivers in the current market cycle. An important leading economic indicator that drives demand in this particular asset class is consumer spending. Personal consumption expenditure has grown 4.73% in 2018 – above the post-2009 consumption growth average of 3.95%. 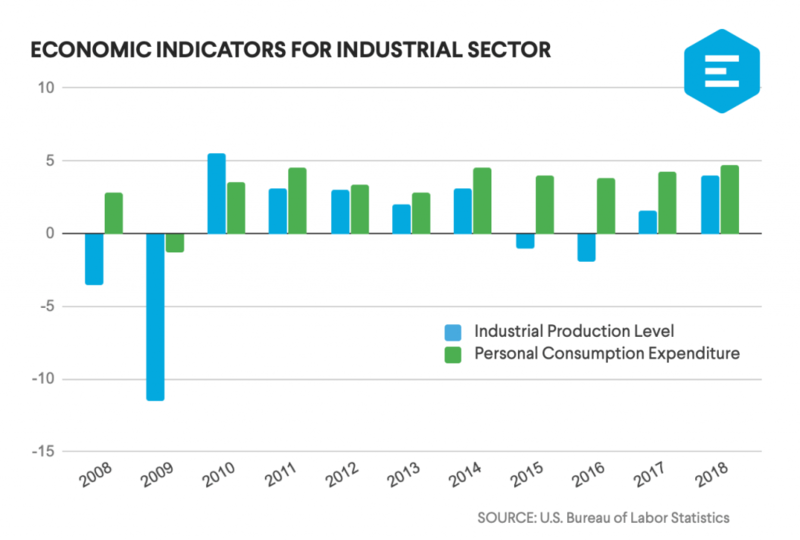 U.S. industrial production, after a short-run slowdown in 2014-2016, has picked up momentum in 2018, exhibiting 4% growth. Employment data in the industrial sector further echoes the positive data from production and consumption growth. Pro-growth fiscal policy has fostered a robust labor market, especially in industrial sectors like manufacturing. 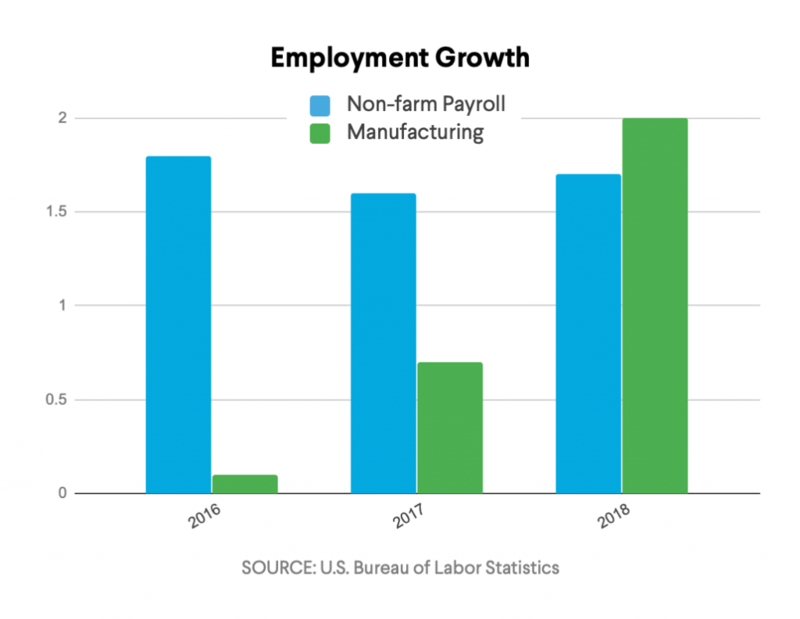 Employment growth in manufacturing surpassed 2.0% in 2018, above the 1.7% figure across all non-farm sectors. According to CBRE, leasing demand for industrial property has been primarily driven by transportation & warehousing, wholesale & retail (including e-commerce) manufacturing and processing. Over the past year, the total net absorption (new move in minus new move out) has surpassed 200 million square foot. This strong demand has led to a year-over-year rent growth of 4.7% on a national level, with some markets exhibiting rent growth up to 22%. 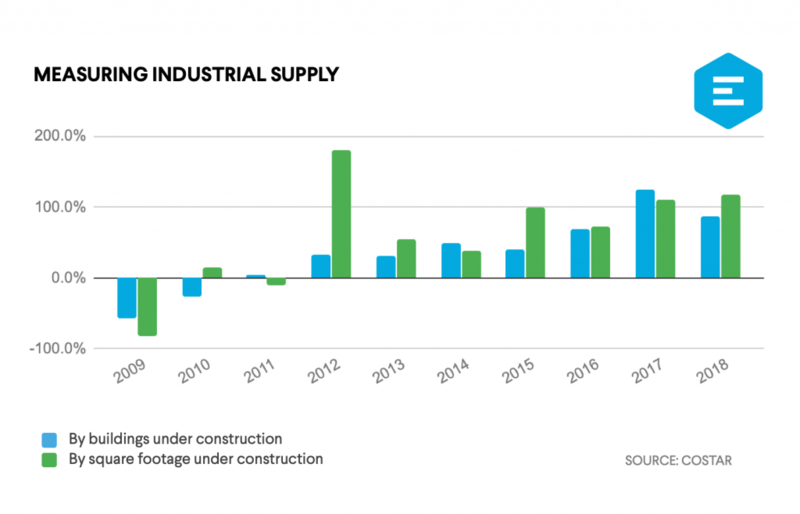 On the supply side, new industrial construction activity has grown considerably since 2011. The year-over-year change in construction volume has been positive since 2012. Analyzing the supply trends exhibited by the number of buildings under construction and square footage under construction, we noticed the growth in square footage from construction, with two exceptions in 2014 and 2017, has consistently outmatched the growth in buildings under construction. These trends demonstrate that recently delivered industrial properties and upcoming deliveries are growing larger in size. New supply is skewed towards larger industrial space, with big-box industrial property (above 500,000 square feet) exhibiting more supply than smaller industrial property. Despite the strong development pipeline across the U.S., leasing velocity outpaced supply in various categories of industrial property. Given this supply and demand imbalance, further rent growth is expected by commercial real estate professionals. In 2018, the national industry rents average $5.76 psf (JLL.) Cushman & Wakefield’s 2019 North American Industrial Outlook forecast a 7% rise in asking rents by the end of 2020. The U.S. industrial property inventory totals 14.0 billion square feet (SF) across approximately 258,000 properties. A research report recently published by Cushman & Wakefield shows only 69.8% of the demand is met by the supply for industrial properties ranging from 50,000-100,000 square foot (measured by deliveries over net absorption) in 2018. For properties with square footage ranging from 100,001 to 300,000 and 300,001 to 500,000, the demand is met by supply respectively, by 89.7% and 80.3%. The supply for properties above 500,000 square foot is currently exceeded by demand, in-line with our analysis of supply above. Typically, industrial properties are segmented into three categories – warehouse and distribution, manufacturing, and flex industrial. Warehouses play a critical role in the modern industrial supply chain. These facilities support storage and distribution activities, which demand large space, elevated ceiling height, and loading capacities. These facilities are typically located in industrial parks – areas zoned and planned for the purpose of industrial development. 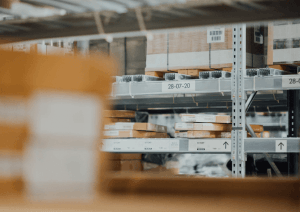 In a race to deliver goods to the end consumer faster and more reliably, tenants are looking for areas with the significant logistic advantage that minimize the facility’s mileage between both customers and materials. Compared to other industrial facilities, large industrial warehouses and distribution facilities typically command the lowest per square foot asking rent. Manufacturing industrial properties – which host assembling and casting space, smaller warehousing, and some office space – is the second largest category of industrial property. This type of industrial property may be less demanding than warehouse and distribution in terms of square footage but has specific requirements regarding infrastructural support. Properties may host extensive power, specialized machinery, pressurized water, and other utility features to fulfill a varied set of tenant demands. Scalability and flexibility are crucial to manufacturing facilities. To allow a manufacturing facility to optimize its operations and productions, these sites typically have accommodating storage space, laboratories for research and development, and offices for administrative (payroll, billing, collections, and marketing). 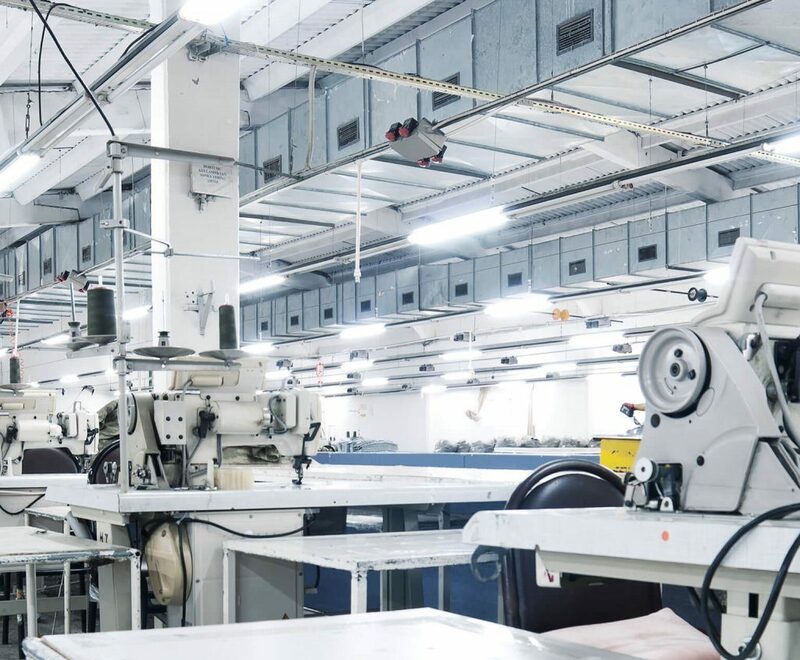 Some states provide qualified manufacturers with property tax deduction benefits on properties that principally conduct manufacturing, processing, and other industrial activities. In the state of New York, for example, qualified manufacturers and manufacturing properties are entitled to receive a 20% deduction on eligible real property taxes. Flex space, the third type of industrial asset, is a hybrid between warehouse and office space. This property is typically located in suburban areas with abundant parking spaces for commuters. Hosting an array of tenants from small operation manufacturers to research and development (R&D) departments of corporations, flex buildings can support numerous operating activities. Flex spaces were originally designed for manufacturers that needed both office and manufacturing space in one building, but the versatility of industrial flex space is now attracting new tenants like tech start-ups. 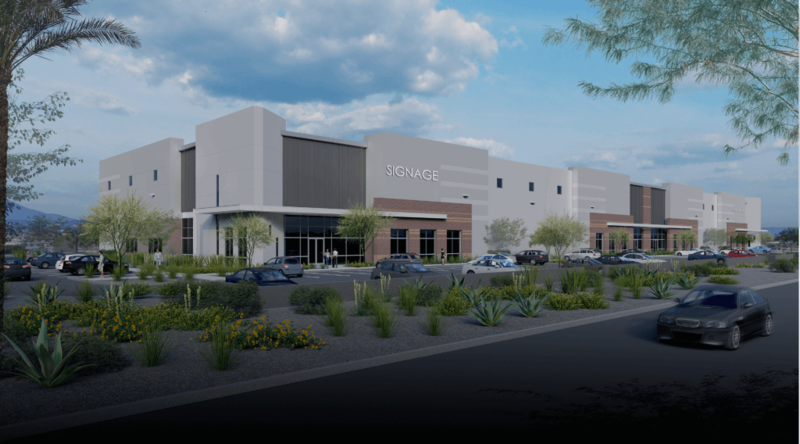 Offering more amenities than other industrial buildings, these flex spaces feature superior exterior and landscaping design and include functional build-outs to satisfy office workers while accommodating industrial activities. As a result, flex space is often ideal for manufacturing, distribution, and storage but can also easily convert to a regular office. A major benefit for the tenant is the ability to configure the flex space at will and adjust the proportion of office and warehouse according to the business’s changing needs. As an alternative to the traditional office, the leasing cost of a flex space industrial property is significantly lower than average leasing cost of class C office space in many U.S. markets. Real estate value is mainly driven by two factors – net operating income and capitalization rate. For industrial properties, operating income can be maximized by various levers. Although the average per-square-foot rent is lower in comparison to other asset types, with square footage ranging anywhere from 50,000 to above 500,000, the sheer size of industrial property can magnify the collectible rent, generating considerable top-line revenue. Industrial property operators can also maximize net operating income through cost reduction. Unlike other asset classes, industrial properties do not have common areas that require periodic maintenance and ongoing improvements. Industrial property owners often sign a triple net lease (NNN) with the tenant, shifting payment responsibilities over building maintenance, insurance, and property taxes to the tenant. Thus, the property will have a lower cost and potentially have an even higher net operating income. Besides the NNN feature, the industrial lease terms are typically longer than other asset classes, ranging between three to fifteen years, with rent escalation on an annual basis. This lease feature makes industrial property ideal for investors seeking longer investment horizons. In contrast to asset classes such as multifamily, where the lease term and tenant quality are in flux, industrial properties might be viewed more favorably for investors looking to lock in their capital longer term while hedging inflation risk. Federal and state legislatures often use incentive programs to attract industrial tenants and developers. Local governing bodies often introduce business-friendly incentives, such as expedited permitting, tax abatements, tax credits and other stimulus programs to attract companies. One such program is the Foreign Trade Zone (FTZ) program. FTZs are governed and administered by the Customs Border Protection (CBP). FTZs allow businesses located within an FTZ to store commercial products without paying customs duties and help reduce the administrative burden of customs entry procedures. Warehouses within FTZ’s that store international trade merchandises can benefit from potential duty-deferral or exemption. FTZ-located properties are also eligible for reductions on property taxes. E-commerce tailwinds have contributed to industrial asset cap rate compression over the years. In a recent National Real Estate Investor article, Adam Herrin of HFF describes “depending on the location and physical quality, older, vintage properties capitalization rates are in the 5.75 percent to 6.75 percent range, compared to the mid- to high-4s for class-A assets.” Interest for development of industrial assets includes insurance companies, institutional investors, domestic pension as well as foreign sovereign wealth funds. In March 2019, Colony Capital purchased a $1.2B industrial portfolio spread across the US. The deal includes 54 properties, expands the company’s footprint by 25%, thus validating institutional appetite for this asset type. Investors and lenders are attracted to speculative development due to not only strong underlying fundamentals but also due to quick delivery times. Industrial buildings have completion timelines as quick as eight to twelve months depending on certain variables – generally a shorter development time frame than with other property types. EquityMultiple launched its first industrial offering in 2015: a cash-flowing industrial park in Tampa Bay, Florida. In March 2019, EquityMultiple was pleased to announce its first Opportunity Zone (OZ) investment with Foundation Capital Partners, a New York-based real estate investment management firm, and Baker Development Corporation, a Chicago-based ground-up development firm with 34 years of experience. Created by the 2017 Federal Tax Reform, Qualified Opportunity Funds offer three unique and compelling tax advantages – investors can defer paying federal capital gains tax from recently sold investments until December 31, 2026, reduce that tax payment by up to 15%, and pay as little as zero taxes on their Opportunity Fund investment if held for 10+ years. Investors can also help spur economic growth in historically under invested neighborhoods. For more on the Opportunity Zone Program and the potential tax advantages afforded to investors, please refer to our Resource Page. Want to learn more about our first Opportunity zone offering? Schedule a call with our Investor Relations team today.